We ❤️ what we do. Like new, barely lived in, 3 bedroom, 2 bath home on 1.25 acres. Open-concept kitchen, dining & living rooms, split-floor plan with plenty of natural of light. Kitchen has large island with lots of seating and great cabinet space. Acreage features both large and medium trees with small storage shed for tools and equipment. Great location, great price, don’t miss out! Like new, 2017 custom-built home at The Crossing at Lick Creek in College Station. Four bedrooms, three full baths and private office in over 2700 sq ft. Open concept living, kitchen and dining rooms function beautifully. Kitchen features large island for baking and entertaining, stainless appliances and shaker style cabinets. Master Suite has nice natural light, garden tub with floating shelves, separate shower and vanities. Well maintained home has lots of nice upgrades and features -- well worth seeing. Beautifully landscaped, oversized corner lot, has ample room for a pool and playground. One stunning 10'3 x 9'2 office available in the Extra Mile Office Condo, fronting William D. Fitch, close to popular eateries and other businesses. Lease includes inviting reception area, shared conference room with television, shared kitchen, coffee bar, wifi, b&w copies, shredding services, phone line, mail slot, two bathrooms, 24-hour access and keyless entry. Other offices leased to realtors and mortgage lenders. Great working environment! Sorry, unable to lease to residential realtors. Among the very best, fabulous residence in Castlegate II. Like-new home, built just last year by David Weekley, features wonderful style and many upgrades. An enviable floorplan with smart separation of spaces provides comfort and privacy, plus easy-flow entertaining. Rooms are large and airy, with high ceilings and windows. 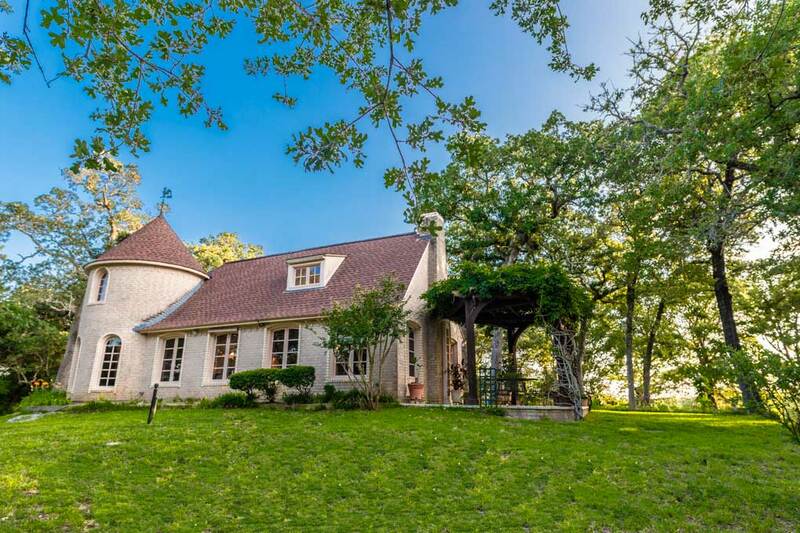 A Country French Retreat tucked away on a secluded hillside with 42 wooded acres - Heaven on Earth! Built by a master artisan from France - a trained ebeniste' - you've never seen craftmanship like this! At the end of a quiet, county road be transported to the porticos of France. The artistry of handcrafted floor-to-ceiling windows, hand-carved beams & Carrara stone fireplace will amaze. Precious, quaint and newly remodeled home on .36 acre corner lot -- just one block off Lasalle Street in Navasota, TX -- one of the birthplaces of the blues. Freshly painted farmhouse-style home features new kitchen appliances and two new window units, providing both air conditioning and heat. Meticulously kept 4 Bed 2 bath, split floor plan, single family home located in the highly desired Alexandria Subdivision. High ceilings, brick fireplace w/gas starter, laminate wood flooring and stainless steel appliances complete the home. The spacious fenced back yard gives privacy as well as space to spread out and enjoy the outdoors. Don't forget the back entrance, two-car attached garage with storage. You will not want to miss out on this great rental! Cul-du-sac charmer! Light and bright, open concept kitchen with stainless appliances and gas cooktop, dining and living rooms. Two story, 4 bedroom, 2.5 bathroom, split floor plan, gives everyone space to call their own. Nice backyard with large patio — perfect for summer entertaining. COUNTRY HOME IN SOUTHEAST COLLEGE STATION IS WAITING FOR YOU. Spacious two-story Hill Country style home with over 2,300 square feet on large one-acre corner lot, just 11 miles from Towerpoint HEB and Starbucks. Bathed in abundant natural light, the open concept kitchen, dining and living rooms are the heart of the home. Kitchen features granite, stainless steel appliances & large island, just right for breakfast and entertaining. Three-way split floor plan with private, downstairs master suite that has separate bathtub, shower and vanities. Large outdoor entertaining area with pool, helps make this a great Texas home! Great looking 3 bedroom, 2 bathroom, open concept ranch on .24 acre lot. White and bright kitchen with island, lots of cabinet space and laminate wood flooring. Enjoy morning coffee on covered patio/deck off master bedroom.Recently painted throughout, new roof, HVAC condenser and motor replaced, plus garbage disposal added. All yard spaces are great for kids and dogs! It also has an extra garage, workshop or even man cave. Come see this home soon! Great floor plan in popular College Station neighborhood. Open concept kitchen, dining and large living room with corner, stone fireplace. Split floor plan features large master suite with separate vanities, garden tub and shower, plus, a mother-in-law suite. Freshly painted nice neutral and beautiful yard with deck for entertaining. New AC unit, New stove and New dishwasher make this home a must see. Neighborhood features well-liked, family-friendly pool, park & trails. Great investment opportunity! 3 bedroom and 2 bathroom home in Edelweiss Gardens. 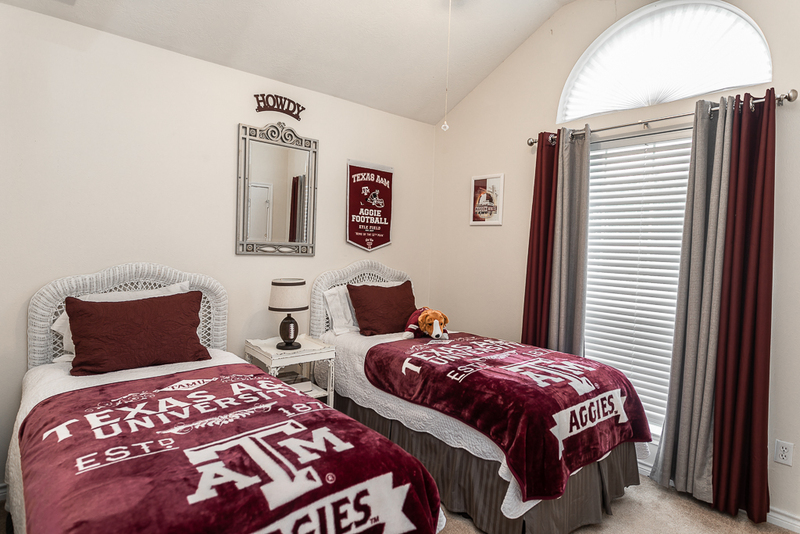 This home is zoned for the new College Station High school. It offers a spacious living room with great kitchen and dining combination. Features include raised ceilings, granite counter-tops in kitchen, built-ins, dimmer light switch in living room, and lots of windows for natural light, and wood and tile floors throughout the home. The split bedroom floor plan allows for a private master suite. The master suite includes walk in closet and vaulted ceiling. The nice size back yard includes a covered patio. Great location and updates. Easy access to schools, shopping, dining, and entertainment! Charming New Builder Home & Guest House. This sunny & bright 4 bed, 3 bath main house features a downstairs master bedroom, open-concept kitchen-living room with wood-burning fireplace & separate dining room, plus an upstairs loft. Kitchen has large island with seating, gas range, microwave drawer, farm sink and oversized pantry for food and appliance storage. The 1 bed, 1 bath guest house with deck offers rental potential or great space for guests to stay. Both homes located on 1+ acre of historic property just 22 minutes from Kyle Field. HOA free. LOCATION-LOCATION-LOCATION! In the heart of midtown w/stellar downtown skyline views, a short walk to the tram for trips to stadiums/zoo/Med Ctr and only blocks to restaurants/bars, bike trails, the bayou & parks! Light, bright, upgraded kitchen with all NEW stainless appliances (fridge conveys! ), granite counters & glass cabinet fronts. New HVAC 2018. Street parking out front + extra pkg in back w/extended driveway. Did NOT flood during Harvey ~ motivated seller says bring an offer! Lovely home sits on a quiet neighborhood street in Copperfield. Featuring 3 bedrooms, 2 bathrooms, rear entry 2-car garage and lots of space for entertaining; this traditional style home is a must see. His and hers vanities in the master bath and a large backyard are just a few of the many reasons this home offers value. A beautiful home, in a great neighborhood, at an even better price! Gorgeous ranch style home balances character and modern amenities. Features 3 bedrooms, 3.5 bathrooms, 2 living areas and dining room. Great open space for entertaining! Recent updates include carpet, paint and interior doors. Originally belonged to the neighborhood's developer, it's a must see home on an amazing half acre lot. Immediate rental income in your pocket! Great four bedroom, two bathroom, brick home with a lease in popular Edelweiss neighborhood, near award winning schools. Home features split floor plan with formal living and dining rooms, open concept kitchen and den with fireplace, large master suite with separate garden tub and shower, plus two vanities. Backyard features covered patio and no backdoor neighbors.All appliances convey. Call or text us today. Well maintained, new roof, accessible to bus routes, shopping, dining, parks and more. Almost 1400 sq ft of living space on a .25 acre lot in nice neighborhood. 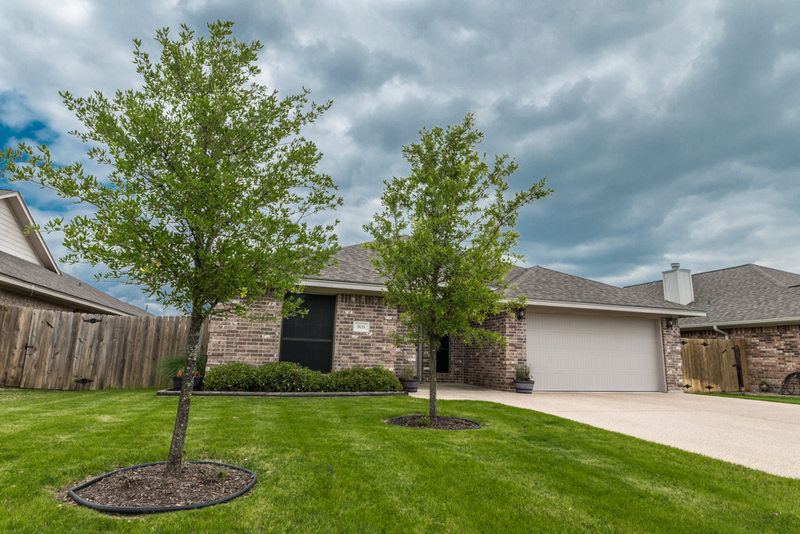 Close to shopping and just 3 miles from Texas A&M University and 6 miles from Blinn College. Country living—fresh air, wide-open spaces, slower pace of life, what's not to love? Adorable ranch with 3 bedrooms, 2 baths, office, renovated kitchen, multiple dining spaces and living room with large fireplace. Nice, large deck for entertaining. Almost 2 acres with several fenced garden areas, nice dedicated space for 4H projects and 3+ bay shop w/ air-conditioned man-space. Check out this gem soon! Stunning 2,357 sq ft Heath Townsend Hill Country home on cul-de-sac lot in popular Creek Meadows Estates, close to the most desirable schools. 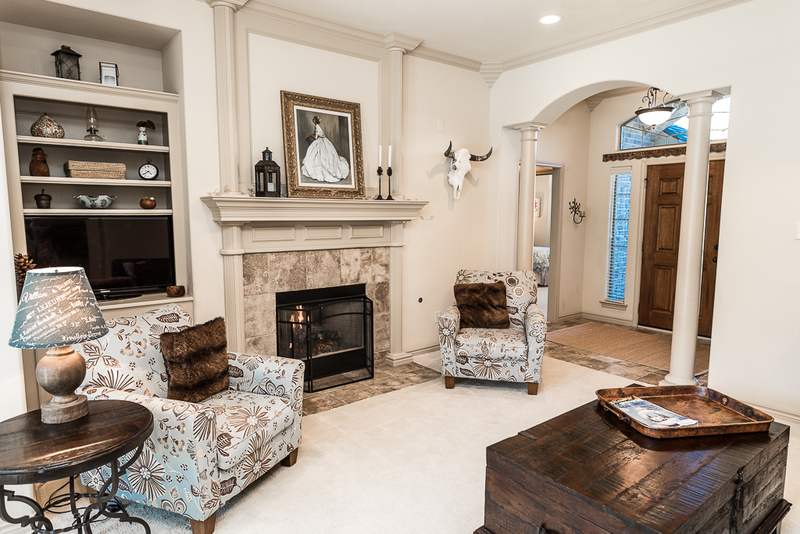 Stone fireplace with large-scale mantel overlooking open concept kitchen, dining & living rooms. Other features include separate office & 3-car garage. The covered back patio & outdoor kitchen overlook a beautiful pool & professionally landscaped yard. Just 8 miles from Texas A&M! This impressive traditional has incredible flow with multiple spaces to relax and unwind and is well suited for entertaining. Large family room with wood burning fireplace, lots of storage, just steps away from the kitchen, breakfast room and sunroom. Unparalleled charm, modern comforts and magnificent brick floors. Features include an abundance of custom cabinetry, gas cooktop, double ovens, coffee bar, built-in desk near oversized utility room with sink. Beautiful home in coveted Dove Crossing neighborhood. Outstanding front and back yards, large open concept kitchen, dining and living rooms, miles of granite counter tops and lots storage. Master suite features separate vanities, shower and garden tub. This great home is ideal for those who prioritize separation and space — a three way split floor plan. Extra wide driveway with lots of parking space and recreational area. Get your home's value - our custom reports include accurate up to date information.